Waves has introduced three new 24-hour offers with reduced prices on their eMo D5 Dynamics, The King's Microphones and API 550 plugins. 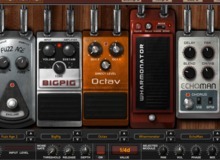 Today only, Waves offers a free GTR3 licence when you buy the CLA Guitars multi-effect processor plugin. For a few hours only, JST is having a special flash sale on their Toneforge Menace virtual amp simulation with 50% off. Audified has released the second generation of its InValve effect suite including models of valve preamp, EQ and compressor.